One of my biggest interests but also one of the hardest things to piece together when writing something like this is to plait together what lies behind the statistics and the dates. How for example, did William Charles Phillips and William Harcourt Hooper get to know each other? The reason I'm so interested in this background information is because it not only brings the characters to life, but also allows us to make connections and see how society worked in a different time and place which is fascinating to me. William H Hooper was born in 1835, His birthplace varies according to which document you look at but the general consensus of his Census entries seems to be Newbury in Berkshire. The first census I found him in was that of 1851, when he is in London with his family and already described as a wood engraver aged only 16. His official biographies say that during the 1850s he went to work for the Illustrated London News and also attended the newly opened Working Men's College as a pupil of Rossetti who taught painting there between 1854 and 1858. For me to find someone, albeit not directly related to my family tree, but very close to it, who knew Rossetti was the most amazing thing for me. When I was very much younger, I used to stand and gaze at his paintings, first of all in the Walker Art Gallery in Liverpool and then in Manchester and London. It was part of finding my identity and his work still means a great deal to me to this day. His paintings are not the comfortable, well-crafted works by Millais or the over-detailed painstaking works of Burne-Jones but depictions of strong and powerful women whose hair flows and curls in the most luxuriant and abundant fashion and whose eyes challenge you straight out of the canvas. Who knows what they were thinking but I don't think it was whether or not they were going to pass their A levels or be able to afford to go the pub on Friday, not to mention get served, which were the things that pre-occupied me in my far off days. No, they were whisked out of their mundanity by being asked to pose for hours as Ophelia or Euridyce, lovelorn and decadently wrapped in dark green crushed velvet and I wanted in. They became my dream and my fantasy world as depicted by the great, slightly crazy master, Dante Gabriel Rosetti. Maybe my cousin Kate and Aunt Martha even met him. Maybe he even visited Grove End Road or they went to Cheyne Walk just as I did one evening long ago just as dusk was falling. The difference being that they were probably invited in while I could only stand at the railings and gaze! I can still feel that connection just as strongly now as I di then. But enough fanciful speculation; whatever else William Hooper took from his classes with the Working Men's College, it made him into a lifelong socialist and he is also possibly the last British artist to engrave on wood. A craftsman who worked with Sir John Tenniel, Lord Leighton and Millais and later William Morris and Burne-Jones who seems to have been a man of integrity and compassion but once again, how is he involved in this story? In 1861, he is still at home with his parents and two brothers in the St. Giles area of London. His father is described as 'Superintendent of Bakery and Bath' and William is still a wood engraver. Even though he is in his twenties, it is still unlikely that he knew William Phillips as the latter, being some ten years younger, was still at school and had not yet entered into the world of business or socialising with those outside his own age group. By the 1871 Census however, things had changed a great deal. William Phillips, now in his mid twenties, was to obtain a special licence to marry Martha Cranmer Oliver in 1872. In the same year, Phillips' Auctioneers of New Bond Street became Phillips and Son, thus establishing him in the business as the third generation. He was growing up and as for William Harcourt Hooper, now 36, he had moved away from his family and was living in the parish of St. Clement Dane, so beloved of actors in London, at number 8 Thanet Place with an assortment of printers , an actress and a journeyman butcher or two! He was obviously at the peak of his powers because the description of his profession which included 'designer of ornaments, engraver on silver and wood etc;' took up three lines of the Census form. Number 15 Wardour Street, now the Jade Garden, where Hannah Terry grew up. If you look to the upper floors, it is possible to sense the original premises. It is even possible that she knew Hooper before knowing Calvert and Phillips because he too, may well have dealt with her father. There is no doubt though, that all three became associated in the early to mid 1870s. Hannah was an only daughter and it often fell to young Victorian women to take care of their older parents instead of or before marrying and again, I would speculate that this was Hannah's fate until her mother died in the spring of 1876 and she and John Calvert were able to be married a few months later in the Parish of Westminster. This came just before the marriage of William Phillips and Martha Oliver which took place at Marylebone later that year. The Calverts set up home in a stucco town house: number 37 Gaisford Street, Kentish Town. The marriage lasted less than a year because on 16th April, 1877, John passed away at Gaysford Street, leaving Hannah and his brother Thomas as executors of his will. He left just under £1000 allowing Hannah to set up home in Lansdowne Hill. I cannot imagine how devastated she must have felt at losing her husband of only a few months but William Hooper obviously maintained their friendship and almost three years to the day of the anniversary of John's death, William Harcourt Hooper and Hannah Calvert were married in the parish of Westminster. The couple then went to live with Hannah's father who, around the same time, moved his premises from number 15 to the much more spacious and grander 162 Wardour Street. William probably worked from those premises at that time, maintaining his father's 'ancient' furniture business and working on his own engravings. The couple obviously sustained their friendship with William Phillips as his name appears on various documents including reprints of the book they collaborated on. He no doubt supported his friend through Martha Olivers death at the end of 1880 and got to know Martha's niece, Kate Hastings Bullen when she appeared to give up acting in order to live at Grove End Road with her uncle and maternal grandmother, Ann Oliver. After a while, possibly after the death of Ann Oliver, Kate began to refer to herself as Mrs. Phillips and in 1884, Geoffrey William Phillips was born. He also has a birth entry under Geoffrey William Bullen and this apparently suggests that the parents were not married but living in a common law partnership. I'm not sure how their relationship worked exactly. Kate, who had had not inconsiderable fame acting with Osmond Tearle and Wilson Barratt's company during the 1860s and 70s playing largely serious leading parts in Shakespeare and other dramas. Once she came to live at Grove End Road however, like Martha, she acted considerably less, if at all. This would have been quite usual for a Victorian actress in those days as the status of women on the stage was so ambiguous that even the greatest actresses such as Ellen Terry felt pressure to abandon it once they were married. This is probably why actors and actresses tended to marry one another, often creating acting dynasties with their children and grandchildren following them onto the stage in the process. On the other hand, William and Kate were not officially married as far as I can see. Their names do not appear in any records of marriage between 1880 and William's death which leads me to believe that they only lived together as man and wife. This also leads to another point for speculation. William had been made a partner in the auctioneers in the early 1870s but after Martha's death the firm had another addition to its title, becoming Phillips, Son and Neale. The Neale referred to was Frederick Neale who was married to William's sister Sarah Jane and had been chief clerk in the business. Maybe his elevation to partner had been simply due to expansion of the firm but it may also have been because William Phillips senior and his family did not fully approve of William Charles' lifestyle. This is just speculation but it is perhaps interesting to note that after William passed away, it is the Neales' children and not Geoffrey who carry on the auctioneering business though it may equally be that Geoffrey simply chose not to work in the family business. After the baby's birth in Thanet, the family carried on living in Grove End Road but when he was only three in 1887, William Charles Phillips died at the age of only 42. One thing that struck me when he died was the brevity of the family announcement in the Morning Post, 'At his residence, 5 Grove End Road, William Charles Phillips aged 42.' That's it. No loving husband of.... of or only son of..... which definitely strikes me as somewhat odd. It seems like Kate felt constrained in what she could say in public, I would say that this was probably because of their marital situation. With this in mind, I found some fascinating research about 'living in sin' in a book entitled 'Co-habiting in Victorian England,' which states that one of the primary reasons for co-habitation amongst the middle classes in England was due to the death of a first spouse when a relative (usually the wife's sister) came to look after the widower and/or any children of the marriage. This seems to have been the case with Kate - I can find no mention of her appearing on the stage anytime after December 1880 when she was part of a Wilson Barrett touring company with Rachel Da Solla and Walter Speakman. The relationship between Kate and William obviously grew and she was calling herself Mrs. Phillips by 1884 when Geoffrey was born. There is another reason they did not marry: they could not. Relationships between an uncle and his wife's niece were declared incestuous until the Marriage Act of 1931 therefore, if William and Kate had gone through a marriage ceremony, they would have risked prosecution. Kate simply could not commit herself to being named as William's widow in his obituary. This amazed me because through everything I've found out, it's clear that William and Kate's committment to one another must have been very strong. At the moment, I also have no idea what he died of despite looking through newspapers for mention of his death and mentions in records or burial inscriptions so the only thing that will really answer that question is to obtain his death certificate which I am going to do. Geoffrey's birth in 1884 seems like an antidote to all the deaths in the Phillips, Hooper and Bullen families in that decade. Before William's death in 1887, his father, William Augustus had passed away in 1884 at his daughter Sarah Jane's house in Bayswater. Her husband, Frederick Neale, who was by now a partner in the business and William Charles were named as executors and he left personal assets of over £9,000. In 1886, Hannah Hooper died, after a comparitively brief marriage of six years to William Harcourt Hooper. There were no children but there was a will as the Married Womens Property Act of 1880 said it was now possible for a married woman to leave a separate will from her husband as a woman's posessions and money no longer became totally those of her husband on marriage. She left £1,465 and her husband was named as sole executor. She was buried in St. Pancras Cemetery. "The day seemed very suitable, for if it had been bright and cheerful it would have jarred upon me". Once again, William H. Hooper was the eecutor of a will but this one was not so straight forward. It did not come to probate until more than a year after Wiliam Phillips died. The main reason for what appears to be a relatively straightforward will to take so long to prove - because it has been contested. He left over £17,000 - part of this will have been his inheritance from his wife as well as his own assets but it appears that someone was not happy with the legacy he left. The outcome however meant that Kate Bullen Phillips was able to live at Grove End Road with Geoffrey for the remainder of her life and her son had a comfortable inheritance after her death. My immediate concern was for poor little Geoffrey; not even seven years old and he had lost both his parents within less than three years. This must have been dreadful for him but there was someone who once again showed the most tremendous loyalty to his friend's family. Not only did he act as executor for Kate's will - she left in the region of £1,000 - he took her son under his wing to live with him at 5 Hammersmith Terrace; an incredibly touching footnote to this part of the story came when I looked a little more closely at Geoffrey's move to Hammesmith. While at Grove End Road there were two young servants named Rosina Warren and Annie Matilda Farringdon. They were first mentioned in 1881, appearing in the census. In the next census, they had moved to Hammermith along with Geoffrey. This mut have been a great consolation to the little boy who had lost so much so quickly. Rosina and Annie then stayed with William Harcourt Hooper until his death in 1912, caring for him through his final illness. So what happened to Geoffrey? For over a year now, he's been a bit of a mystery even by my family's standards but I feel I'm starting to unravel a few things about his life. Brought up in a beautiful house in St. John's Wood, he would have had a fairly privileged early life. Rosina and Annie most probably helped care for him from birth and he will have had all the advantages that being the son of wealthy parents could bring. One of these, I was astonished to find was having his portrait painted by a member of the Royal Academy! 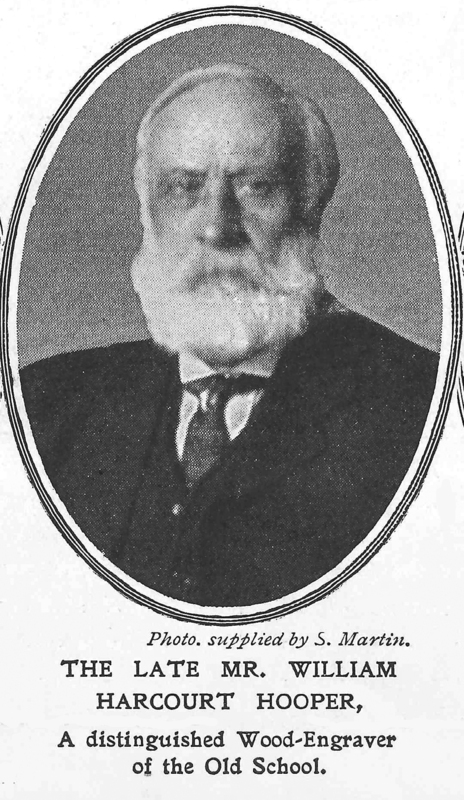 In 1887, E. J. Gregory A.R.A. exhibited at the exhibition of the Institute of Painters in Oils and this comment appeared in The Liverpool Mercury for 1st December, 'E.J. Gregory has a portrait of Master Phillips, a red haired child in dark red robes, which beside being bright and strong of tint is powerful in effect. Childhood is admirably rendered.' I was instantly alerted - could this be my Master Phillips? I then found this in The Pall Mall Gazette, ' Mr. E.J. Gregory at his boldest and best in his excellent 'Portrait of 'Master Geoffrey Phillips,' - the life-size portrait of a fair, but not beautiful, three year old child dressed in a ruby coloured velvet cape and frock - an aggressive looking youngster. it is a masterly canvas, painted with great breadth but with perfect rendering of texture.' This has to be him - Geoffrey was such an unusual name at that time - there is only one of that name in censuses and records for that period so it cannot be anyone else. I was delighted to read this, not to mention highly amused by the journalist's description of my cousin. We Bullens tend to grow into our looks! My only regret so far is that, despite trawling through all the works by E.J. Gregory that I can find, I cannot find this one. I did however, come across a wood engraving from around the same period entitled 'A Rehearsal,' which made me wonder. 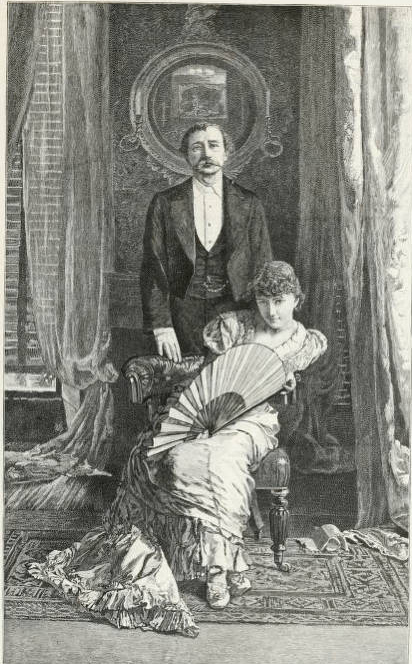 It depicts two people, the female sitting with a large fan and a man standing behind her. He apparently has been listening to her recite or sing. I have a very strong feeling that this may be a depiction of Master Geoffrey Hastings' parents. I can't be sure but sometimes you have to trust your instincts not to mention the fact that a close friend of both the painter and the artist was the most famous engraver on wood in England: William Harcourt Hooper. Thereis little else to tell about this part of Geoffrey's life other than something he recalls himself but I'll save that for now. All I know about his childhood and adolescence is that he spent it at 5 Hammersmith Terrace with Rosina, Annie and William, his step-father. In 1901, he is again in the Census but this time his occupation entry tells us that he is at school. As yet, I haven't been able to find his school but he was obviously a boarder and I would imagine, received a good education paid for by his parents' legacy. Six years go by, still without any mention of him that I can find as a young man growing up, when 1907 yields a particularly rich crop of events! First of all Geoffrey was married with an announcement in the edition for the 16th November: 'At Fulham on 12th, Geoffrey William, only son of the late William Phillips of St. John's Wood to Lottie, only daughter of Edward Storey of Stone.' A little more research was able to tell me a bit more about the new bride. Charlotte Storey was born in 1881 in Aylesbury in Buckinghamshire. Her father was Edward Storey and her mother: Ellen Fincher. Ellen had been married before to John james Fincher, a grocer, in Kensington. They were married in 1866 when Ellen was 21 burt he died just a few years later leaving Ellen a young widow. There is then a curious entry in the 1871 Census return that lists the only Ellen Fincher I can find of the right age that lists Ellen as a 'night attendant in an asylum.' This was at the Hanwell Asylum just outside London which apparently had one of the more enlightened treatment regimes towards the mentally ill and it would appear that Ellen had taken on work in order to provide for herself and her child. In 1880, she is listed as marrying Edward Storey from St. Neots - eight years younger than she was and also working as an attendant in an asylum, Indeed they are both mentioned in the Buckingham Herald as being night attendants in the cases of two patients who were suffering from epilepsy and died suddenly. By the time they were married, they were both working in the same asylum; indeed, it looks as if they may even have met there, which would certainly have provided an interesting answer for their children or grandchildren when they asked how they got together! The family consisted of Edward, Ellen and Ellen's daughter Elizabeth and then Charlotte or Lottie came along in 1881. Both parents seem to have belonged to a Wesleyan Church and according to reports in The Buckingham Herald, Lottie soon began to display her singing talents in various church-based activities. In 1887 for example aged just six, she is singing in a concert given by the Weslyan Juvenile Missionary Association. The song she delivered was entitled, 'A Little Black.' According to the Bucks. Herald, the concert reviewed the work done 'by the juveniles that year.' There is no more mention that I can find of Lottie in the newspaper until a few years later when her singing is talked about again. In 1896, she is noted as delivering a dialogue at that year's Sunday School entertainment and then in 1897, she sang 'In the Heart of London Town' at the Weslyan Church Harvest Festival. There is then another mention, but this time, Lottie, now aged 18, has stepped outside the security of the church concert and has moved to the commercial theatre. In 1899, she received a very goood review for her singing in a play entitled 'Skipped by The Light of the Moon,' at the Imprial Theatre, Bordesley in Birmingham. Apparently, the first night could not go on 'owing to the vagaries of the electric light,' but this was subsequently repaired and the company was well received. The final mention I can find of her singing with the Weslyan Church comes in 1901 when she sings a solo as part of a concert given in aid of the Aylesbury Sick Visiting Society. The reason I have documented these appearances is to show how her career as a performer progressed but then something else happened. Lottie changed her name; by the time of her marriage to Geoffrey in 1907, her registration in the marriage register is in two names: Charlotte Storey and Edna Knollys. How did I know Lottie and Edna were the same person? First of all, the law states that if you marry and are known by two names then you must state both of them upon marriage and Charlotte Storey and Edna Knollys both marry Geoffrey William Phillips on a mid-November day ion 1907. Prior to this, Lottie had begun to disapperar from newspaper reviews and accounts of her theatre work from around 1901. She had obviously decided that a career lay on the stage but not as Lottie Storey. Why did she change her name? Actresses changed their name for any number of reasons but I get the impression that Lottie had been a strong member of the Weslyan Church and religion and the theatre very often did not sit hand in hand. It probably felt better if her two personas did not mix so she became the more mature and sophisticated sounding. Edna Knollys. This appears to have happened in 1900 and the newly-named Edna went on tour, appearing at The Theatre Royal Warrington in a production of The Ticket of Leave man as Sam Willoughby with a favourable notice, saying she performed 'very well.' Her notice a week later in The Era described her as being 'quite at home' in the same role when the play moved to New Brighton. For a first venture on to the road, there were certainly some interesting members of the company Edna joined; not least the manager who was Sime Seruya who was born in 1876 in Portugal and came to England at around 1900. From a fairly wealthy background, she became a vocal and passionate suffragette. She went to Holloway Prison for her views, had letters smuggled out of prison that she had written on lavatory paper and founded the first and longest lasting Womens' Movement bookshop in London. Such a dynamic character must have made some impression on the teenage Edna as she forged her stage career. I know she was also in George Dance's company at some time between 1900 and 1907 and played in popular operettas up and down the country such as: Kitty Grey, A Country Girl and Three Little Maids. An account of being in this company by another actress tells how hard a taskmaster he was and how hard it was to survive in such a gruelling environment, learning song upon song and travelling to venue after venue. In 1907, she also appeared in pantomime: Mother Goose at the Crown Theatre, Peckham and with her in the cast was a certain William Phillips. I have no doubt that this must be our Geoffrey William Phillips, adapting his name slightly for the stage. He must have decided to follow his mother's line of work rather than going into the art world or the auctioneering business. This is the only incidence I can find of them working together or indeed of Edna working on the stage after her marriage in November of that year. Their next appearance together is in the Census of 1911 which certainly brought up a few surprises. They have by now moved right out of London, to Herne Bay on the Kent Coast close to Geoffrey's place of birth. Edna has kept her stage name but has combined it with her married name and is now Mrs. Edna Phillips. They have been married for 3 years; there are no children and Geoffrey describes himself, aged 26, as a retired actor! Their address is 'Lyndhurst, Canterbury Road, Herne Bay, which is a rather swish 10 roomed villa and they have a 22 year old housemaid called Grace Olive Monk. Now this is what I call living the good life - retired at 26, a lovely house by the sea and someone to make my breakfast every day but somehow I sense things were not quite as rosy as they seemed. Is it the lack of children or maybe the lack of focus that underlies being retired at 26? I'm not sure but I do sense a lack of direction, however there are hints from newspapers and family documents that suggest how their lives were going. Their affluence is underlined by various details - for example, they are listed in the telephone directory for 1911 and 1912. In 1912, there were only 231 telephone exchanges throughout Britain with more than 500 subscribers each and there far fewer domestic than business subscribers. I suspect that in order for the young couple to live such a privileged lifestyle, Geoffrey must have come into his inheritance. His guardian, William Hooper had also passed away in 1912 so I would also suspect that a legacy had also come via this route. Geoffrey had also been elected to the Herne Bay Council and took an active part in community life. There is less mention of Edna, but there are a couple of short newspaper articles which seem to link her to her old life: one is the death of an important member of the congregation of her old church at Stone. A floral tribute was sent to mark his passing by Mrs. G.W. Phillips - Herne Bay. In the same year Mrs. Phillips made a gift of 'periodicals' to the Blean Asylum. Lottie Storey may have changed her name but she still existed somewhere under the glossy surface of Edna Phillips' new life in Herne Bay. They were listed as living at Lyndhurst during 1911, 1912 and for part of 1913. In that year, Geoffrey appears to have been particularly busy - in April he was elected Vice Chairman of the new Conservative Club and in May, he was best man at one of his his friend's weddings. This was John Adam Tytler Derham who was described as a good all round sportsman and star player for the Herne Bay Rink Hockey Club. The account states that it was no surprise that Geoffrey was chosen to be best man as he was President of the club! Many of the guests wore their club badges as support for the groom and the wedding to Consuela de Colegan, the daughter of a Spanish Marques, attracted a good deal of local interest. I had no idea that Geoffrey was such a sportsperson nor such a community stalwart. It would seem that having given up acting, he threw himself into hs new role as local worthy wth gusto! After that, both Edna and Geoffrey simply seem to gradually fade from life in Herne Bay. They are listed as giving some prizes at yet another angling competition in 1917 and Geoffrey's name is still on the Council in 1918 but by 1920, their name is no longer in the Telephone Directory and in the 1922 Post Office Directory, their listing has disappeared; so where did they go? Explaining his disappearance to different people as I was researching his story, the majority of people said that Geoffrey must have been killed in the war and I tended to agree but can find no record of him in any military records nor could I find any evidence of what happened to Edna.... but then came two huge surprises. The first one concerned Edna. If Geoffrey had been killed in the war, what might she have done? For some reason, I kept thinking that she may have gone abroad so idly looking through some passenger records, I found her name. At first, I thought that it couldn't be her but it was. She left Britain on 2nd August 1924 just over ninety one years ago now. 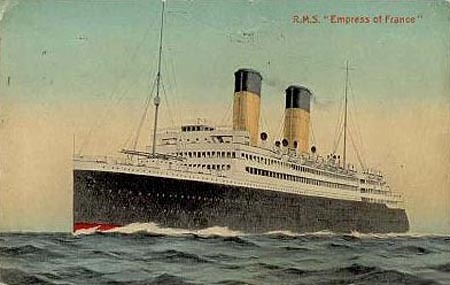 She boarded the Empress of France for Quebec arriving several weeks later. According to records, she had been planning her trip for a year but where had she been until then? I have absolutely no idea. Records tell us that she had applied to go on the trip in 1923. The departure form tells us that she paid for her own passage and took £50 wth her. It states that she was a housewife aged 37, travelled second class and that her address in England was c/o Phillips, Son and Neale, Auctioneers of 73 New Bond Street. To say that I was tken aback when I read this would be an understatement. Somehow I had never associated Edna with Geoffrey's family as he had been an orphan for so long yet she must have known where his inheritance came from and from this one line which simply states the address, it becomes clear that she had a connection with them. The plot thickens when she arrives in Canada and fills in the disembarkation form. By now, she is 43 - she obviously decided to tell her real age and says that she is not making Canada her country of permanent residence. At the point where she has to state whether or not she is married, a very obvious letter Y is transformed into a W for widow. In the time it took The Empress of Canada to cross the Atlantic, Edna lost six years from her age and killed off her husband. She also gives a different address for her last address in London. Instead of 73 New Bond Street, she gives 40 Herne Hill Road, SE24 and says that her aunt who lives there is her closest relatve in England. A fair bit of research showed me that in 1898, Thomas Bland Storey, a long-standing member of the Buckinghamshire Police Force had died there. This was Edna Phillips/Lottie Storey's grandfather. His eldest daughter, Charlotte Elizabeth, Lottie's father Edward's eldest sister. She had married a doctor, William Mulholland Turner and the couple had continued living at 40 Herne Hill Road and this was where Lottie/Edna went to stay before leaving for Quebec. Why then did Edna's story change so much when she landed in Canada? Researching her, I have bcome convinced that she was not a dishonest woman. Anything but. She had been brought up in the Weslyan Methodist Church as an active member. She had been a pillar of the community in Herne Bay so what happened? I can imagine that Edna felt she should tell the truth when confronted by a probably rather stern Immigration Officer in Canada. I also think that the Y that became a W became even more significant after revealing her story to the said official. It all hinges on what happened to Geoffrey. After joining Kitchener's Army, it is very difficult to locate him other than via the mention of him at Herne bay in 1917. After that he seems to disappear completely. There is no trace of him in Rolls of Honour, Army Pension Records or Medal Lists and I believe it to be because he disappeared or 'went awol.' Who knows why? I can't tell but I believe he left his home, possibly after being on leave one day and just didn't return. I also discovered that when someone goes missing under UK law, their spouse or family can declare them dead after seven years and I believe that this is what happened here. Edna was unsure which status to declare, explained that she had not seen her husband for seven years and was therefore declared a widow. I honestly believe that she thought he was dead or that he was at least dead to her and this is borne out by something she was quoted as saying later. I think the Phillips/Neale family paid her passage to Canada so that she would relinquish any claim on Geoffrey's estate but that may not have been the case. She also declared that she was going to stay with a Mrs. L. Jocelyn of 12 Brant Road, Burlington, Ontario whom she named as a friend. More research revealed a family of that name living at that address. The son/husband, who had been Head of the Burlington Fire Service, Tom Jocelyn had died in 1921 of nephritis. They had emigrated to Canada in 1915; maybe Edna, as a friend of the family from England, had gone to visit his widow. And there we leave her. Or do we? I came across this footnote to her story appearing in the Gloucester Evening Telegraph of November 1938, almost 31 years to the day of her 31st Wedding Anniversary. Edna was 56. Toronto. Ontario: Edna Knollys, an opera star of forty years ago, who used to have fashionable audiences at her feet, has been working in kitchens and scrubbing floors to keep herself alive in her later years, it is revealed here. The star of 'A Country Girl.' 'Kitty Grey,' and 'Three Little Maids,' in her day, Miss Knollys turned up at a hospital here to sing to the patients. After her husband's death she explained, she came to Canada 24 years ago hoping for a fresh start. But she has had to work with her hands ever since. That is the last thing I have been able to find about her. I am more than convinced that Edna believed Geoffrey was dead but he too, leaves this account of his life with a twist.